There was a time when Rich Guy and I would take the leisurely drive down I-5 to Burlington for some Krispy Kremes. Yes, I realize it was more of a curiousity rather than finding the best donut. Ever since we got a location in North Delta, the draw is no longer there. 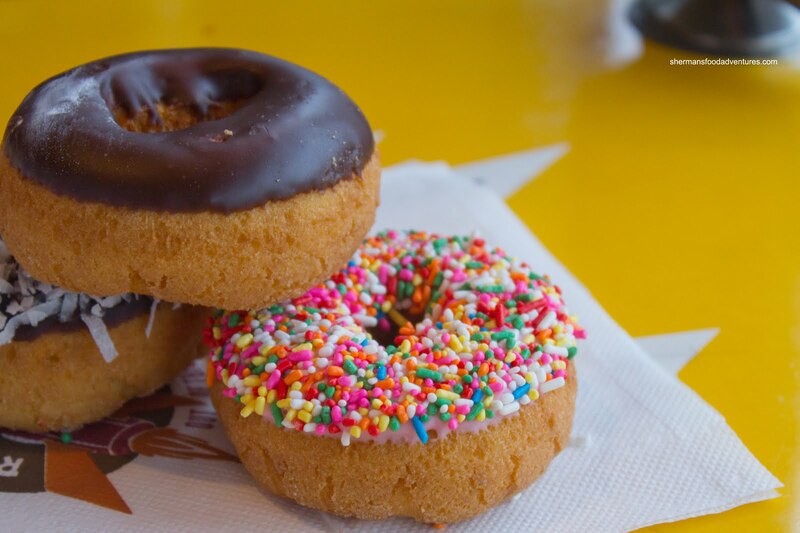 The next novelty donut shop that hit our radar was Top Pot out of Seattle. Yum-O! Ah yes, this is Rachel Ray's favourite... Boy we are suckers for the Food Network eh? After that, I found myself going as far as Portland for some unique donuts. Yup, it was no other than Voodoo Donut - as seen on The Amazing Race and No Reservations. Hype? Absolutely, but the bacon maple bar was well worth the drive. Crispy bacon... on a donut. Genius! Wait a minute. I don't need to drive that far! Little did I know, right under my nose was a place in Bellingham called Rocket Donuts. Looking for the place sans GPS (since my new car doesn't have it), it was not really all that hard to find due to the large rocket in front. On the inside, the decor has a diner feel to it despite being a donut shop. Then in the display, there it was... the Bacon Maple Donut. Boy, I haven't had one of these since my visit to Voodoo Donut. 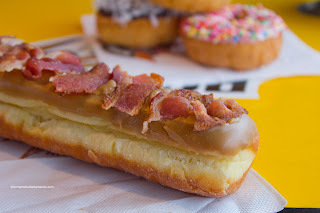 Yes, it is a novelty item, but trust me, bacon and donut do go together. In fact, I kinda like this one more. The yeast donut was soft with a slight chew while the maple glaze was sweet, yet not overly so. There was plenty of perfectly cooked bacon on top which was meaty, not fatty. Salty and sweet. Yum. Now we wouldn't have only one donut would we? It's like going to Dim Sum and having only one dish. Or better yet, heading down to the states and buying a stick of gum. Wait, that is merely what people claim to have purchased while crossing the border... Do they really get away with that? 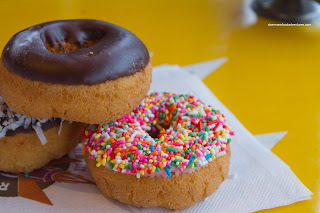 Anyways, we tried some of their cake donuts such as the Coconut, Chocolate Glazed and Sprinkles. What I liked about their donuts was that they looked neat and carefully prepared. 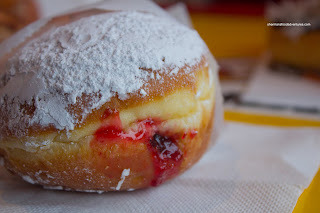 I wouldn't say the cake donuts were any better than some of the other good donuts shops along the Westcoast. However, I wouldn't hesitate to say they weren't any worse either. 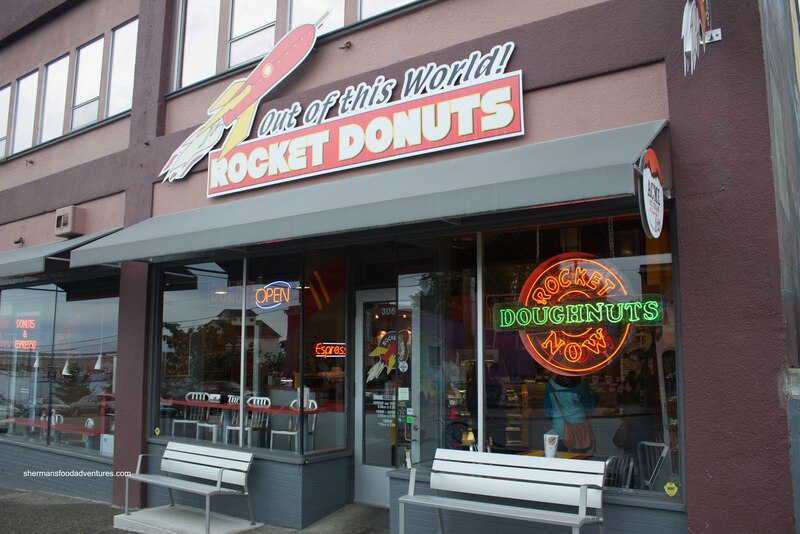 And considering that Rocket Donuts is located in Bellingham, that can be considered a real gem. Now for good measure, we also tried their Breakfast Sausage Burrito. Although it was obviously per-prepared and merely warmed up for us, it was pretty darn good. 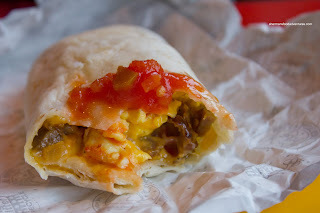 Within the soft flour tortilla, there was fluffy eggs, tasty sausage and cheese. A dollop of salsa and this was a satisfying breakfast. But honestly, the story here are the donuts and they are mighty fine considering that we didn't need to drive to Portland or Seattle to get them. Diner? yes, but you didn't mention their nod to the old sci fi movies of old. Did you see the robot in the other room? Also, their own house made ice cream is pretty good too. Very creamy and dense. We only sampled it, but swore we would be back for more. Also, if you're fond of all things bacon, it seems to be all the rage at the Baker's Market. I was there today and they had bacon in everything, from scones to cookies, candies and donuts of course. You've got one more week to check it out as they'll be closed for the rest of the year. @Holly Yup, all your descriptions ring true. I just didn't have enough room to write it all or I was just plain lazy. LOL... Yes, I gotta make it to the baker's market sometime. Especially since I know the person who runs it.